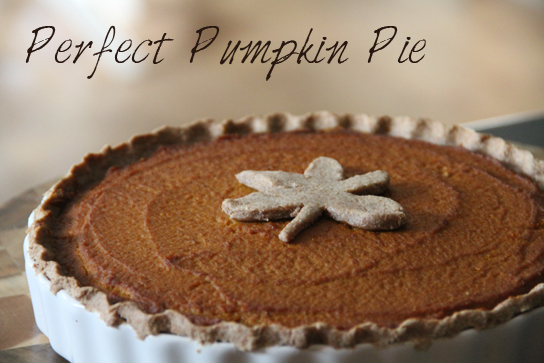 If you plan on making a pumpkin pie this holiday season I highly recommend trying this one out, you won’t regret it! Not only that it’s vegan and gluten free it’s also rich and creamy, and has got the perfect amount of spices. So this year, instead of buying a pumpkin pie, try making one from scratch. Place the flour, salt, and sugar in the food processor fitted with the S blade. Pulse to combine. Add your solid coconut oil and pulse until mixture is crumbly and will stick together when you squeeze it between fingers. Add in 1/3 cup water, or until the dough holds together well and is visibly starting to come together in the food processor. Dough should be easy to shape into a large ball. If necessary, add a little more water until the texture is right. Turn dough onto a clean, dry surface that has been dusted with flour. 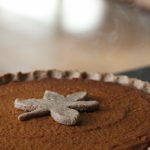 Use a rolling pin to roll the dough into a large circle–enough that you can imagine easily covering your pie pan–use extra flour to keep things from sticking. Carefully lift the dough onto your pie crust (little tears are fine, and you can fix them later). Squeeze the edges to make a pretty pattern. Refrigerate crust till you have the filling made and are ready to bake it. Blend all pie filling ingredients in a food processor till super smooth. The mixture should be quite thick, but if it’s too thick you can thin it with a tablespoon or two of water or non dairy milk. Spoon into the crust, smooth over, and bake until the edges of the crust are golden brown and the filling is dark (45 to 50 minutes). Let cool for a while before serving. Use a rolling pin to roll the dough into a large circle--enough that you can imagine easily covering your pie pan--use extra flour to keep things from sticking. Blend all pie filling ingredients in a food processor till super smooth. The mixture should be quite thick, but if it's too thick you can thin it with a tablespoon or two of water or non dairy milk.